It�s perhaps not a marbled Palace of the Venetian Grand Canal, although the setting is certainly aqueous enough, nevertheless there is an Emperor in Seattle and he really does live the life of an Italian master of the arts. 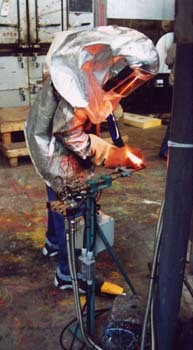 Indeed he trained in Italy at the Venini Factory and the influences he found there have never left him. Dale Chihuly (born in Tacoma, 1941) and founder of the Pilchuck Glass School, is probably the greatest showman of the �glassworld�. His brilliantly colourful work is treasured the world over and his events draw huge crowds. In 2002 the garden display in Garfield Park, Chicago was immensely popular and the Chihuly at the V&A in London drew big crowds. A recent work, the $12-million Dale Chihuly Bridge of Glass in Tacoma, WA, is unique. A glass ceiling of seaform pieces welcome you, leading to a wall of his Venetian vases with 110 pieces straddling the highway. 12 metre towers of blue glass ice-crystals rise over the bridge leading to the new Arthur Erickson designed Museum of Glass on Dock Row. The Barnum of glass lives as flamboyantly as his glass designs in a vast, former boathouse, which serves as a working studio/home under a bridge in Seattle. It sports an 25.5 metre dining table (a complete tree in fact), suspended over which are his amazing Venetian chandeliers. 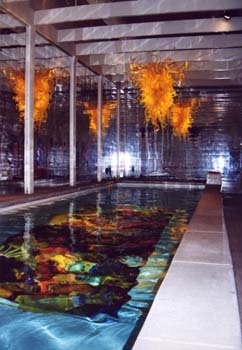 There�s also a 30 metre mirror lined swimming pool where you swim over submerged Chihuly �seaforms� tropical flora glass. 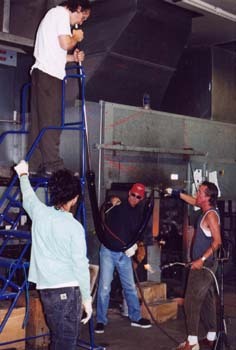 The hot glass studio is fascinating and teams, under guest glass artists or Chihuly himself, interpret the astonishingly vibrant inspirational paintings that Dale creates (collectors items on their own) using them as the template for his varied designs. 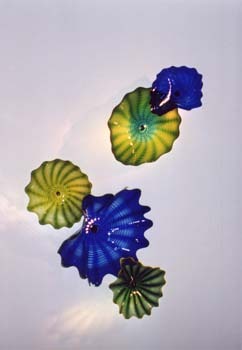 The output is prolific and Chihuly glass design is always evolving. Witness the Macchias, a vivid organic influence is always at the root of his work; this glass wants to live. 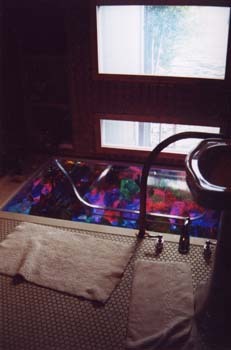 The boathouse sports a sunken guest bedroom that faces out onto the water, at boat level and in the bathroom, there�s sunken Chihuly �seaforms� under the transparent bath. At the touch of a button the window turns opaque in case you�re bashful. 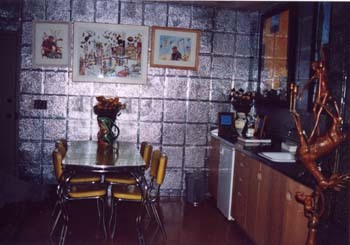 The kitchen and indeed the entire boathouse is decorated in 19th century tinplate metallic grey and gives it an authentic touch, but then again, if you have ever seen �A Man with Two Brains� you�ll also appreciate Dale Chihuly�s sense of fun. There is a receiving room where his vast collection of native Indian blankets is on show and although he does have private rooms above the �shop� he really does use these spaces and swim in the pool� absolutely necessary after hours of blowing hot glass. Deceptively unassuming outside, inside this really is Seattle�s own Venetian Palace.